I’ve been asked to share this Dilly Cucumber Salad Recipe ever since the first time I posted about it – the last time I was at the Waterloo Urban Farmer’s Market. I’ve not ignored you, but I wanted a video to go along with the recipe. I will have to say, I am pretty stoked about this video-it took less than 2 hrs to complete (from setting up the recipe, filming, editing, etc.). One thing I’m not so stoked about is all the extra water we’ve received over the last week. We had 7.1 inches of rain Aug 31-Sept 5th. A lot of water has been moving through the area and several areas are flooded. My heart goes out all who have water in their homes, fields, businesses or other places causing them distress. In times like these it’s hard to imagine how much our bodies need water to work properly. Adults are about 60% water. Infants, on the other hand, are about 78% water-the reason they dehydrate so easily. How much water do I need to drink every day? It depends. Most people can start with the 8 x 8 Rule (8-8 oz glasses of water a day), but some people require more or less depending on their circumstances. In general, we can all stand to drink more plain water. Thirst can be easily mistaken for hunger. The next time those first hunger pangs strike, try drinking a big glass of water. Quenching your thirst may be what your body is actually asking for. Does diet pop, coffee, tea, etc. count? Plain water is best, but I usually tell people they can start with non-caloric, non-caffeinated, and non-fizzy beverages (if they have to). Like decaf coffee or those flavored drops added to water. 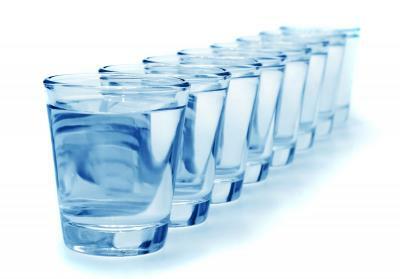 I still encourage people to work toward drinking more plain water. It’s better for you, cheaper, and much easier to access. Many foods also have a high water content and why cucumbers are so refreshing. Fruits and vegetables generally have very high water content-cucumbers ranking the highest at 96% water. That’s one reason I like to eat them in the summer. It’s like water with a crunch. Adding tomatoes, onions & dill just amplifies their mouth watering crispiness. This recipe is super easy and is another way to fix these abundant, in-season vegetables. I liked using the dill weed instead of the dill seed that is usually used to flavor pickles. It also adds eye-cathing spceks of dark green color to the salad.